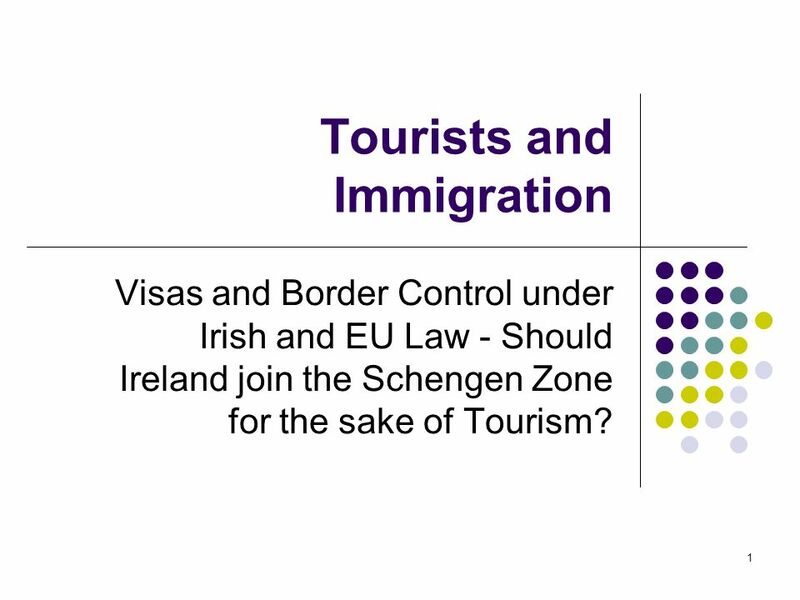 Visas and Border Control under Irish and EU Law - Should Ireland join the Schengen Zone for the sake of Tourism? 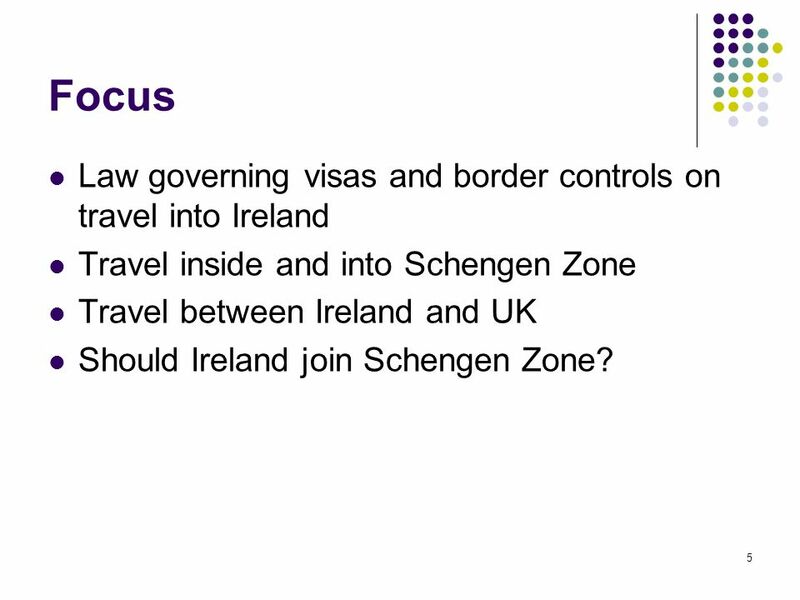 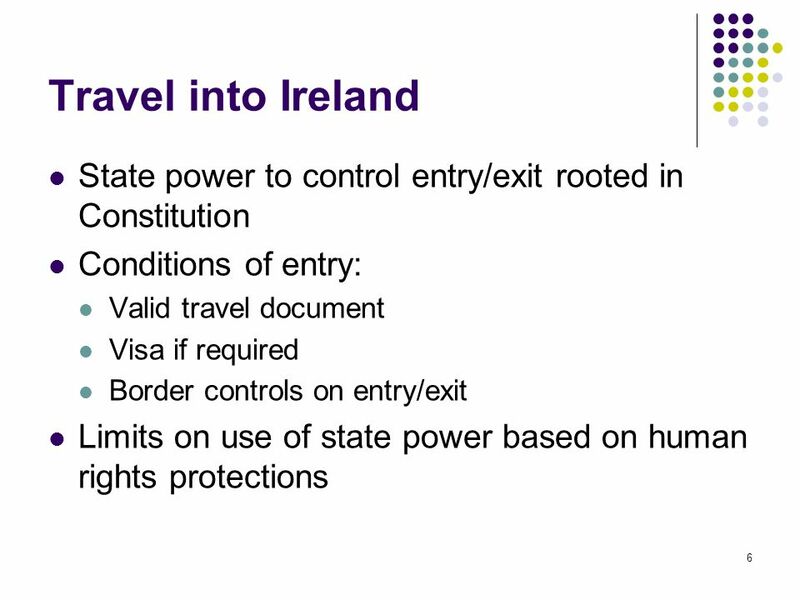 Travel inside and into Schengen Zone Travel between Ireland and UK Should Ireland join Schengen Zone? 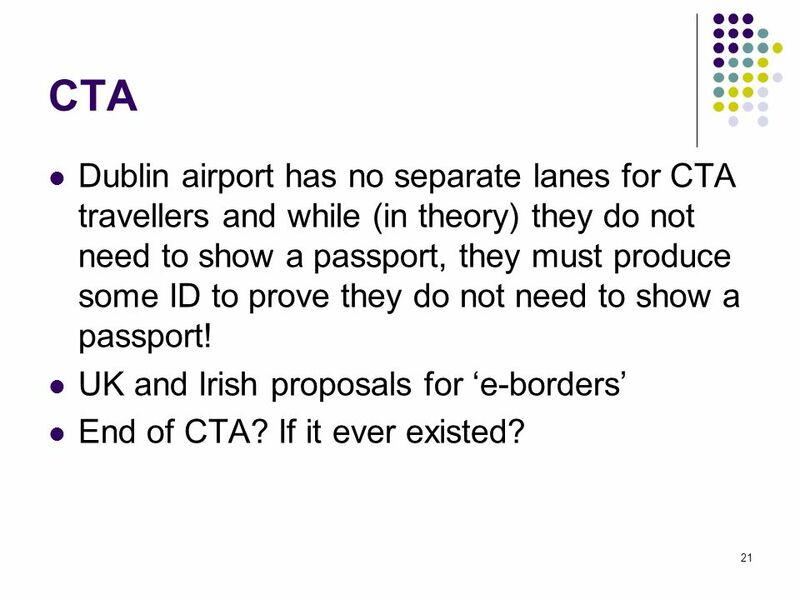 21 CTA Dublin airport has no separate lanes for CTA travellers and while (in theory) they do not need to show a passport, they must produce some ID to prove they do not need to show a passport! 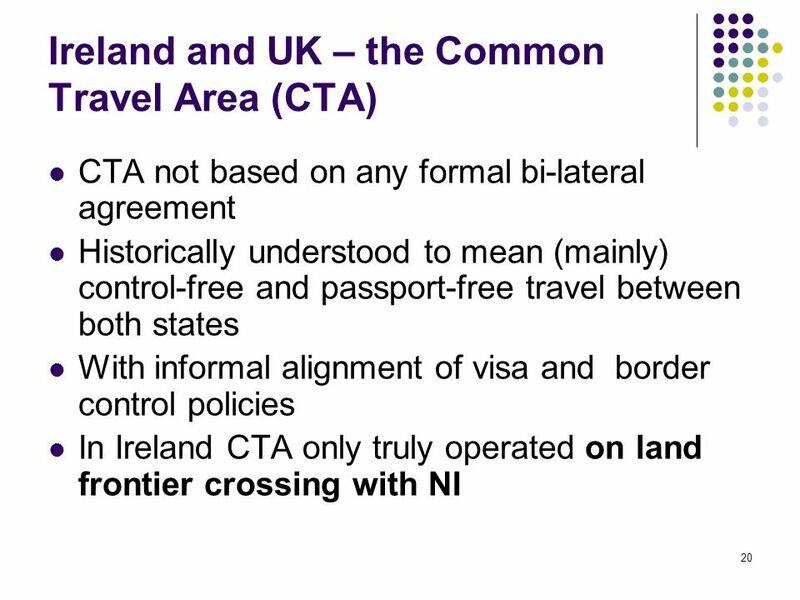 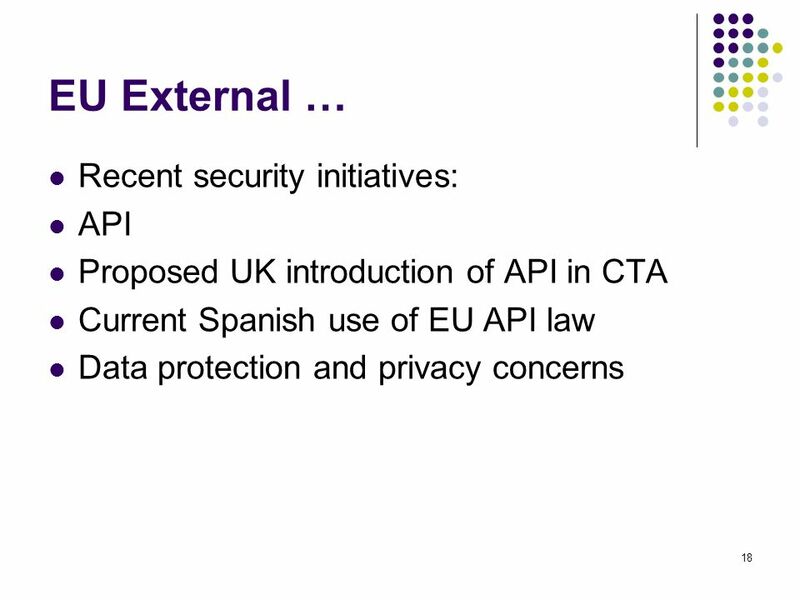 UK and Irish proposals for ‘e-borders’ End of CTA? 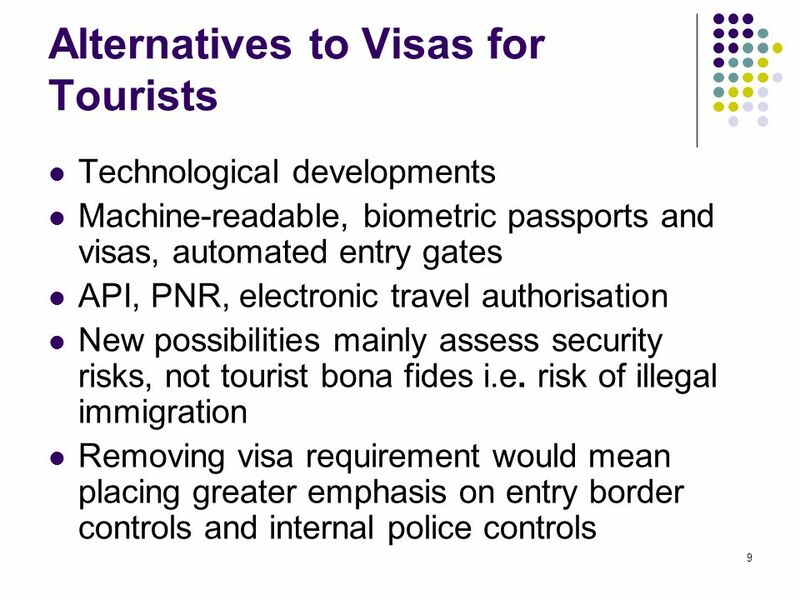 If it ever existed? 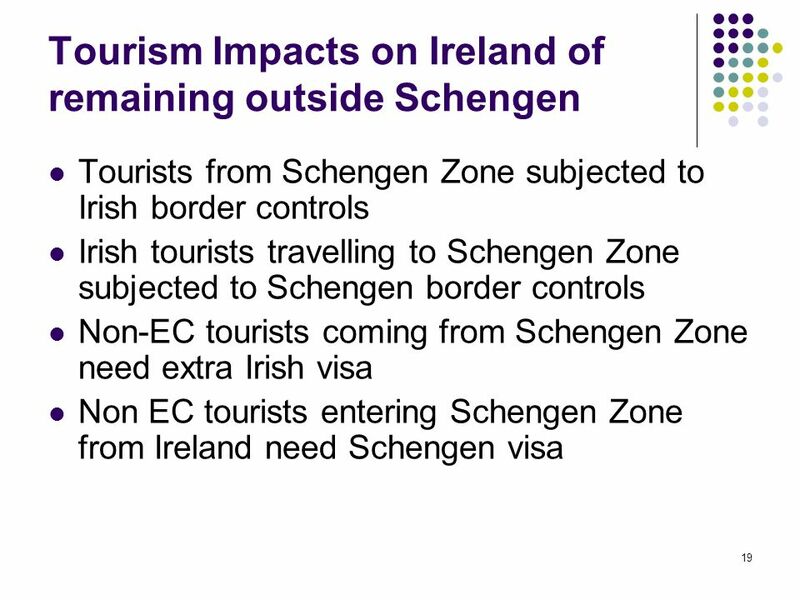 22 Should Ireland join the Schengen Zone for the sake of Tourism? 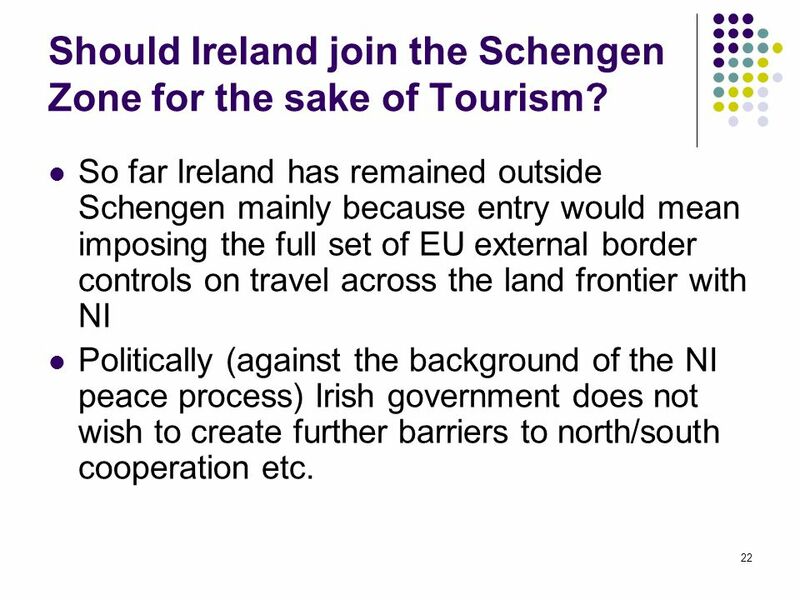 So far Ireland has remained outside Schengen mainly because entry would mean imposing the full set of EU external border controls on travel across the land frontier with NI Politically (against the background of the NI peace process) Irish government does not wish to create further barriers to north/south cooperation etc. 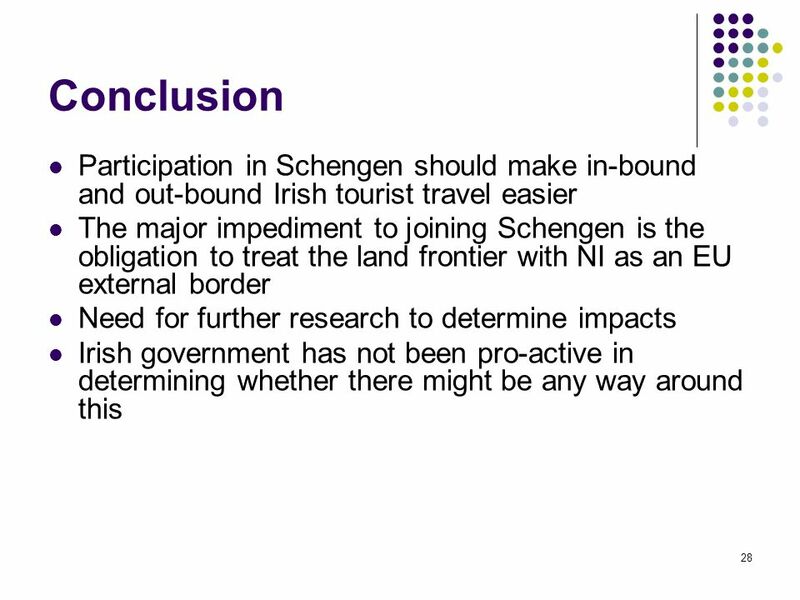 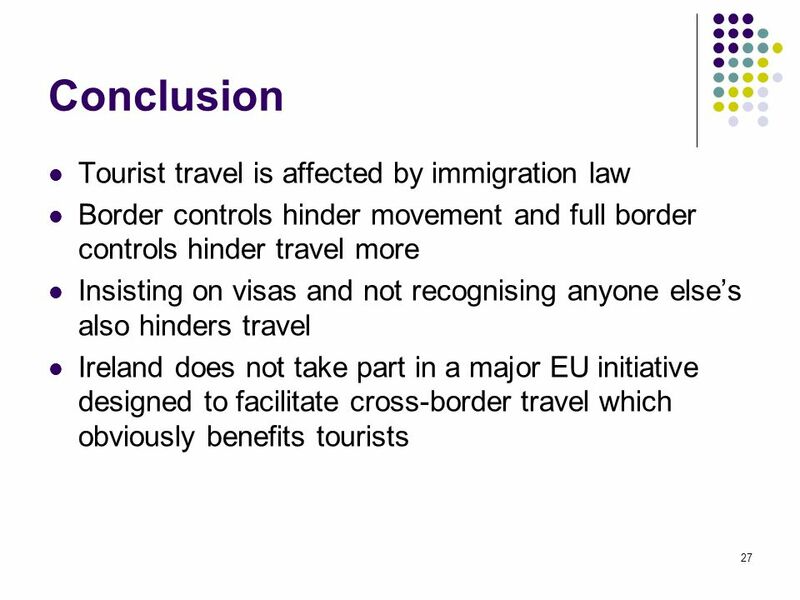 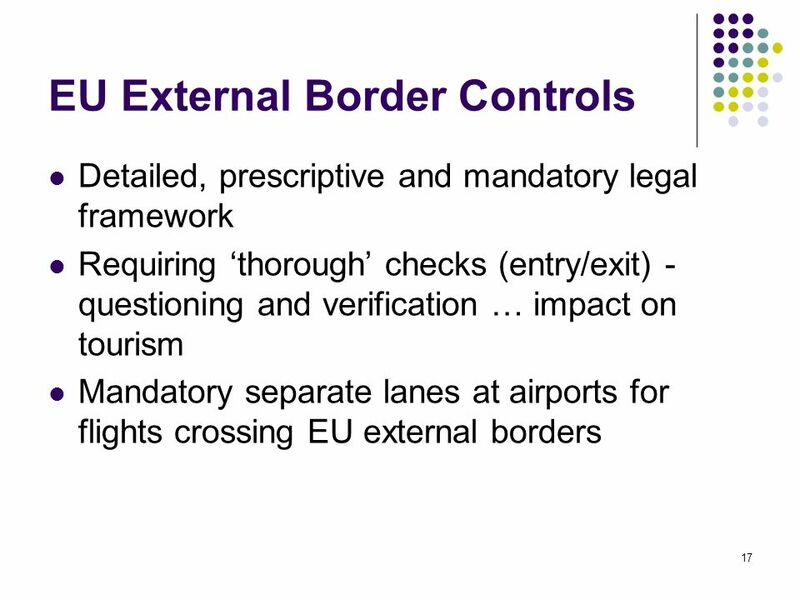 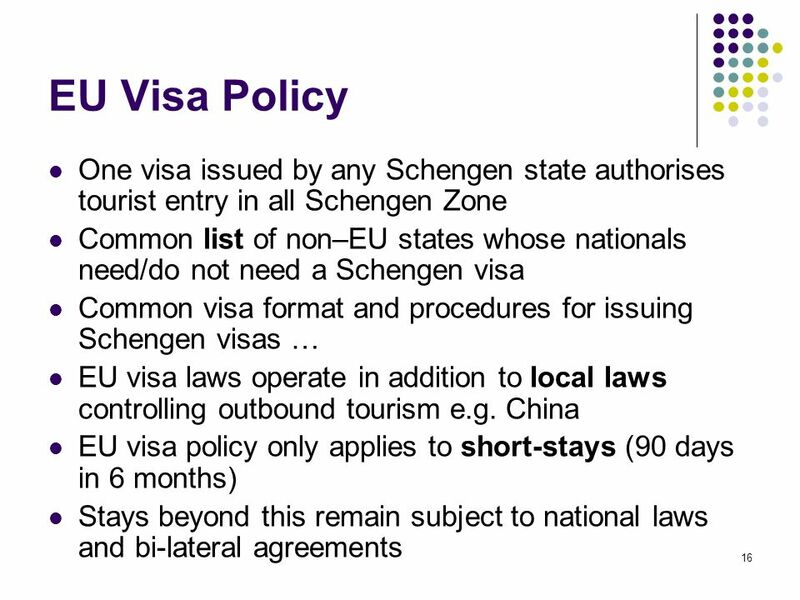 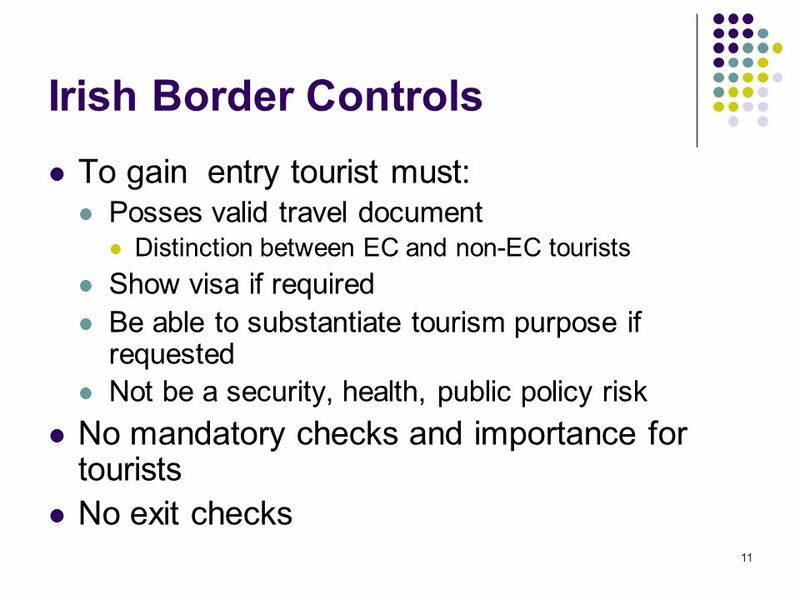 past losses from being outside Schengen future benefits from being inside Schengen Also, little/no pressure from in/out-bound tourism industry for joining Schengen Volume of illegal migration across land frontier with NI? 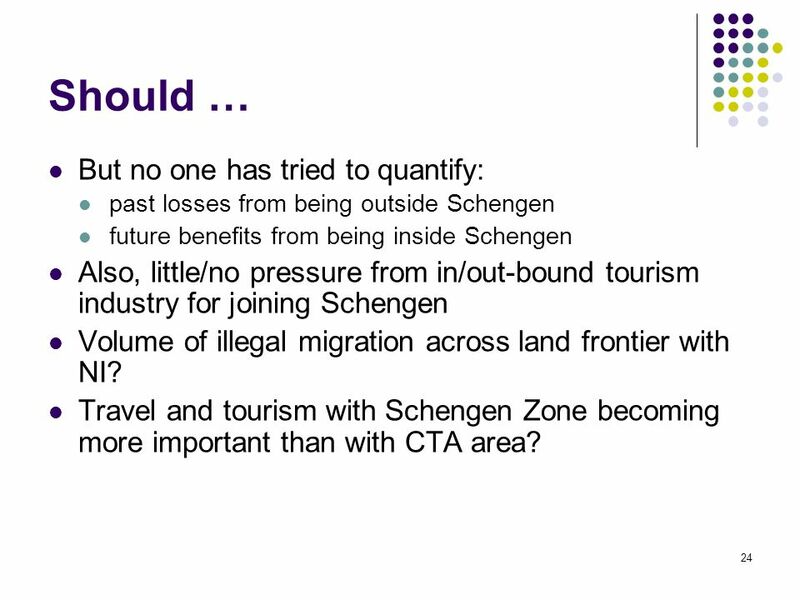 Travel and tourism with Schengen Zone becoming more important than with CTA area? 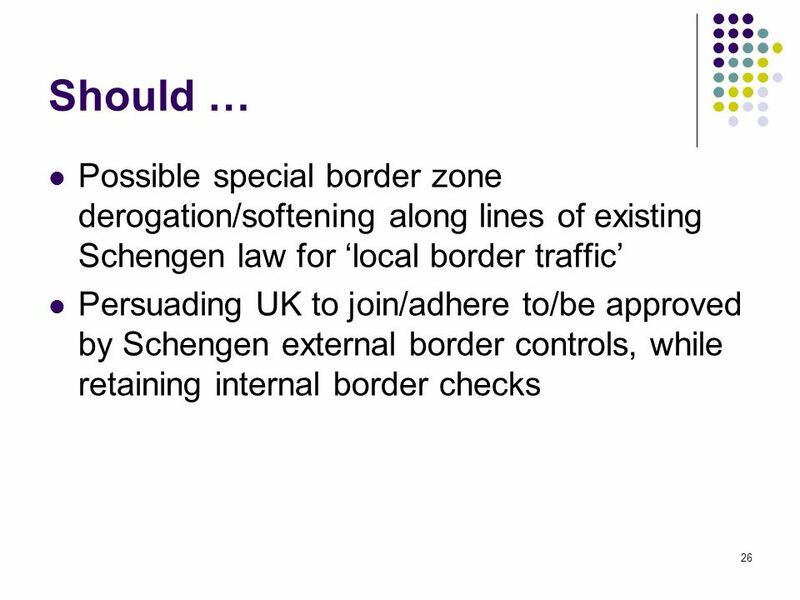 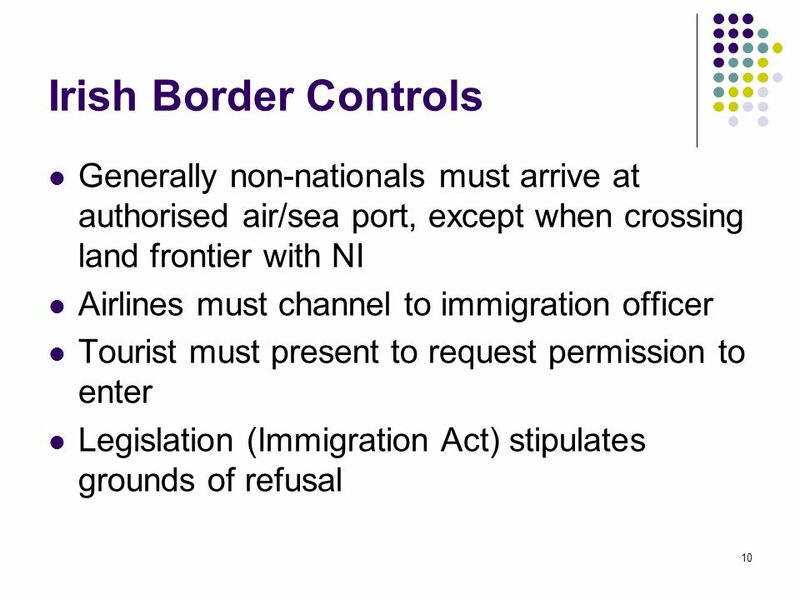 25 Should … How ‘untouchable’ is the Schengen obligation to operate external border controls on land frontier with NI? 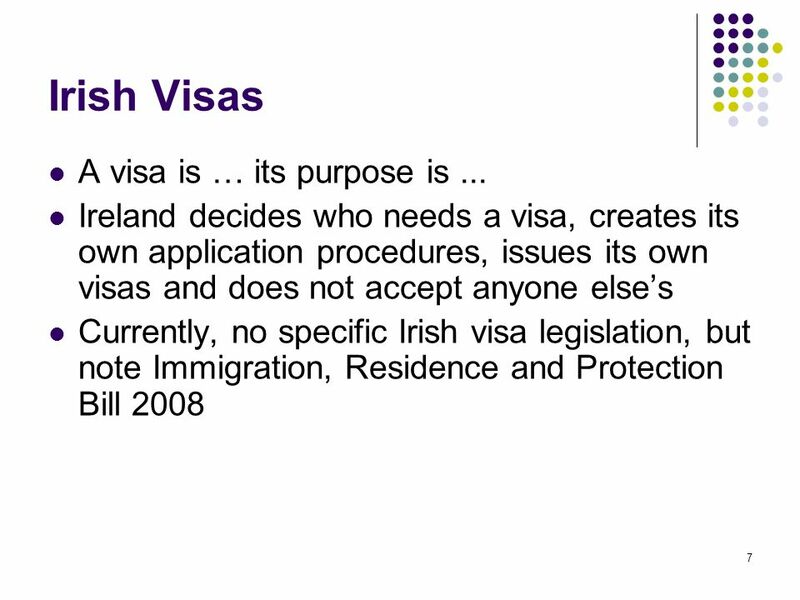 Any ways round it? 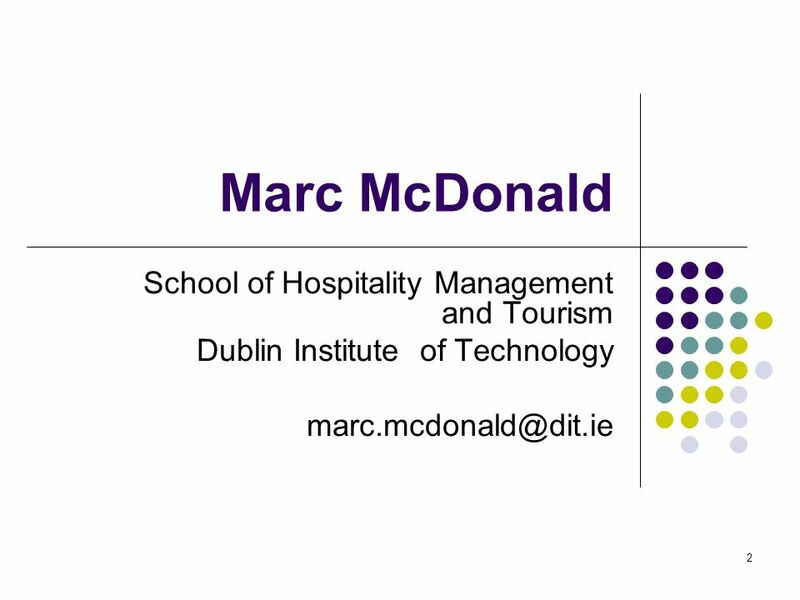 Softening it? 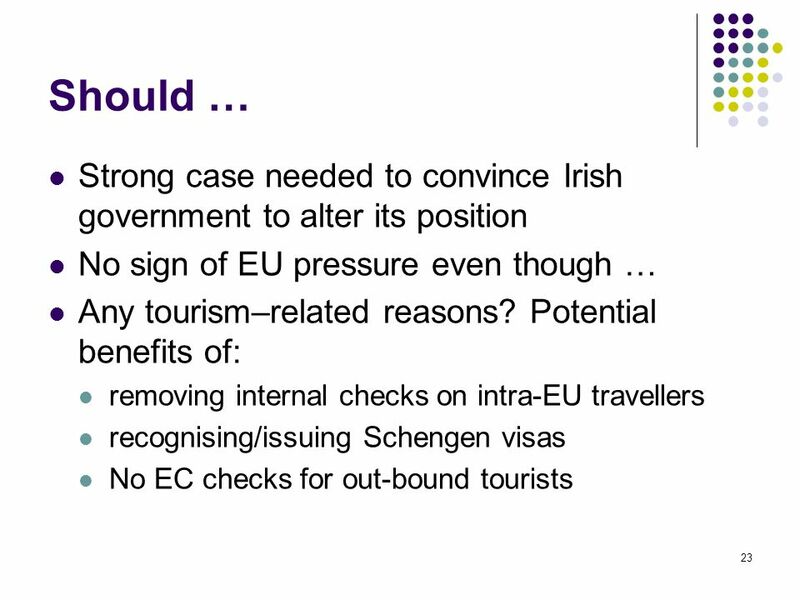 So far, not much evidence of Irish government exploring softening measures Seeking (longish/experimental) transitional derogation? 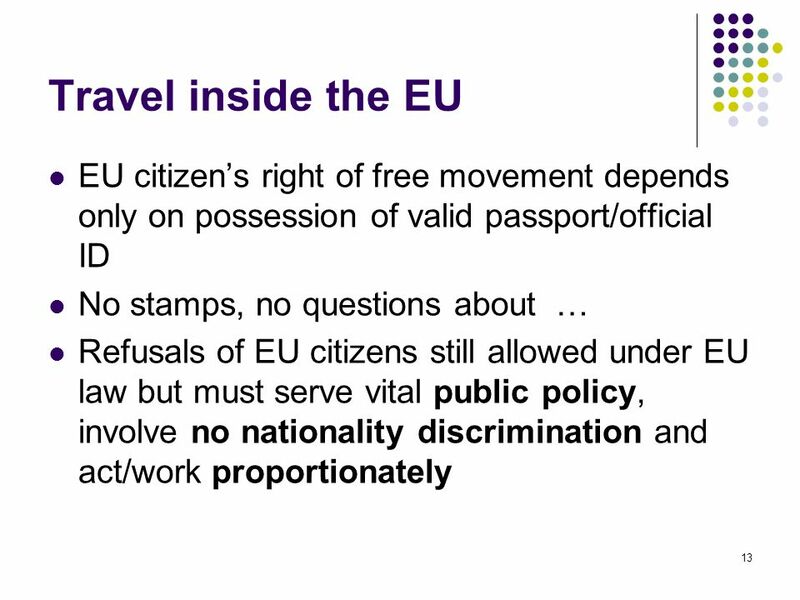 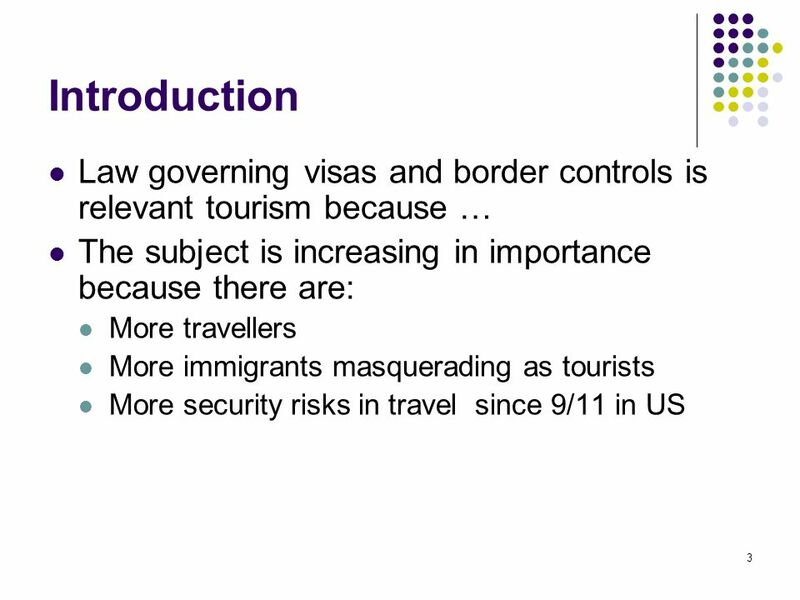 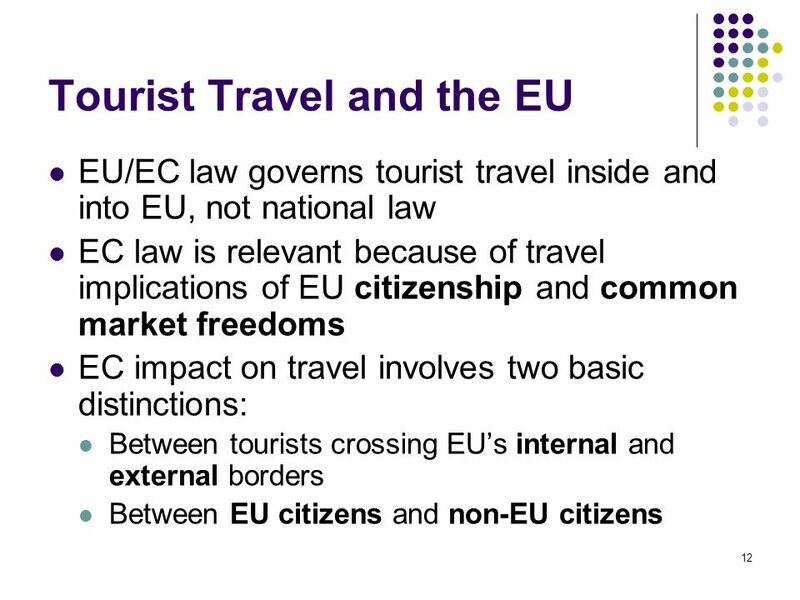 Download ppt "Tourists and Immigration"
Erasmus Work Placement Workshop: the risk & insurance implications Rachel Phillips Marsh UK HE Practice Leader Mary Murtagh – Marsh Risk. 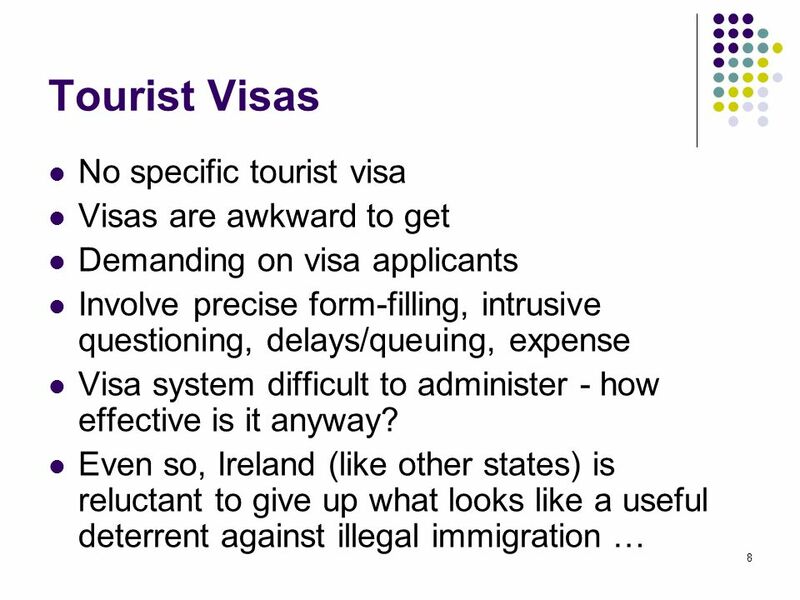 Improving the Effectiveness of Interviewer Administered Surveys though Refusal Avoidance Training Grace E. ONeill Presented by Anne Russell U.S. Census. 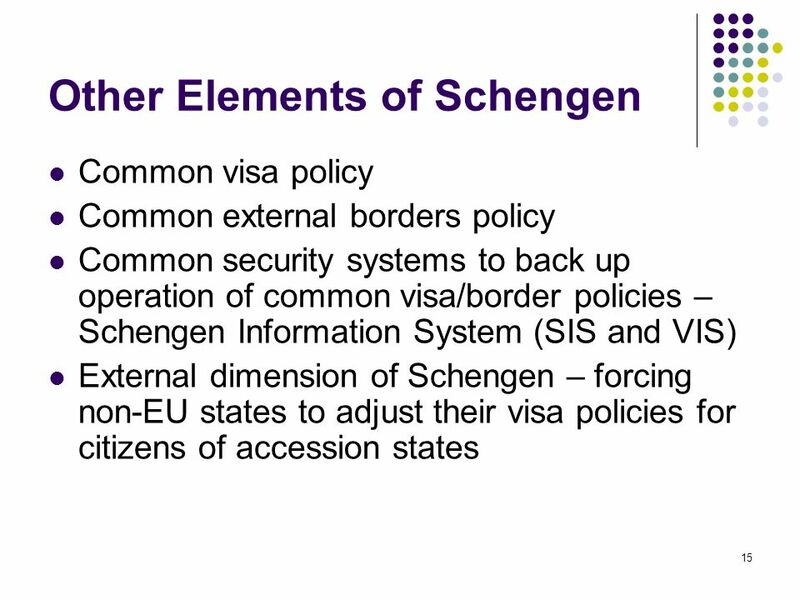 Mode 4 in the Cariforum-EU Economic Partnership Agreement (EPA) Ramesh Chaitoo WTO Symposium on Mode 4 of the GATS: Taking Stock and Moving. 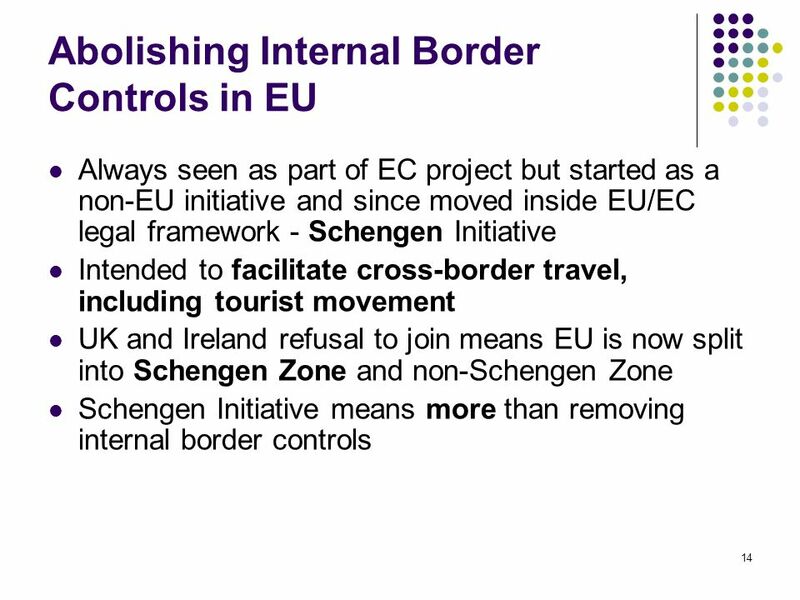 Management and control systems Franck Sébert, DG Regional and Urban Policy, Head of Unit C1 FOURTEENTH MEETING OF THE EXPERT GROUP ON.